Welcome to the June 2014 links mashup post! I’ve put together what I think is a fun list of articles this month that covers the gamut of the WordPress experience, from using and installing plugins to improving site security, to theme optimization and beyond. It’s hard to narrow down this list for the month because there’s so much excellent content out there. In any case, I hope you find it useful. Enjoy! WordPress at the Risk of First Impressions – This Tom McFarlin piece explores the effect first impressions have on whether or not developers stick with WordPress or flock to another platform. How to Build a WordPress Plugin to Identify Old Posts – Wouldn’t it be nice if blogs identified posts that are more than four years old upfront? This Tuts+ tutorial shows you how to build a plugin to accomplish just that on your own site. Choosing a WordPress Form Plugin – If you’ve been debating between Gravity Forms, Ninja Forms, and Formidable Pro, this Chris Lema post will walk you through the pros and cons of each. 10 Best Image Optimization Plugins to Speed Up Your WordPress Site – Proper image optimization can make your site a whole lot faster. WPMU Dev gives you ten solid options here. Automate These 30 WordPress Tasks with IFTTT – I haven’t delved into IFTTT that much yet but these 30 ways to use it with WordPress are compelling and worth checking out. Are You Prepared Against a Hack? – Smashing Magazine offers up a “seven-step disaster-recovery plan” to make your site hack proof, or at the very least, allow you to deal with it effectively. 5 Quality Importers for WordPress – If you ever need to import content from an old WordPress site to a new one, this list of five importers ought to be a useful resource. Why WordPress Consultants Should Care About Mobile Apps – The mobile future of the web is here and this post lays out the details of what consultants and developers should be aware of regarding mobile app development. 11 Questions to Ask Before Adding Long-Form Content to Your WordPress Site – Really interesting article about what you need to consider before publishing long-form content. Hint: it’s not just about the text. WordPress Tips: 15 Common WordPress Errors with Solutions – Helpful list to review if you ever run into a problem with your WordPress site from internal server errors to password retrieval issues. LayoutPress: A Drag & Drop Starter Theme – Drag-and-drop themes are hot right now and this is a pretty thorough review of another one you might want to check out sometime soon. 40 of the Best WordPress App Themes for Verticals and Niches – Really helpful list if you’re looking to build your own marketplace on WordPress. How to Make Your WordPress Homepage Look Like a Real Magazine – If you’re an online publisher, this guide will be super useful to you. Plus, who wouldn’t want to add a little magazine-style flair to their site? How to Quickly Batch Delete Spam Comments – Just as the title says. Read this tutorial and don’t waste time individually deleting spam comments ever again. Free WordPress Themes for May 2014 – Here’s a nice collection of 11 free themes you might want to check out when you get a chance. Reset the Net – Straight from the official WordPress.com blog, this announcement reveals they’re joining the Reset the Net campaign to fight against mass surveillance and will be adding SSL to all WordPress.com subdomains before the year is out. How to Set Up a Marketing Strategy Using WordPress – This one’s from our editor, Tom Ewer. A great post about how to use WordPress to build a full-fledged marketing strategy, from content to SEO to advertising. How to Give Your Online Store’s Search a Power Boost – Another from our very own Managing Editor, this post talks all about optimizing your e-commerce site for search and why it’s important. We’ve got two interesting infographics for you this month. 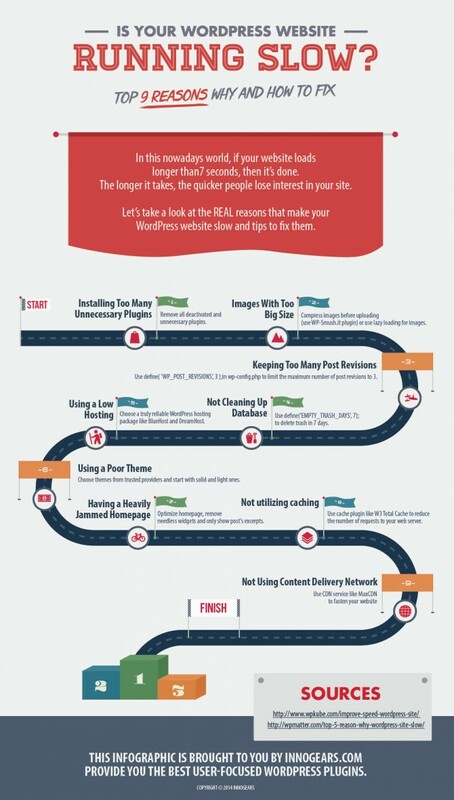 First up, an infographic that helps you figure out if your WordPress site is running slow, and if it is, how to fix it. The second is a cheat sheet for social media profile image sizes – pretty invaluable if you want to make the most of social media for your blog. Next blogpost:What’s the Best Way to Add Custom Code to WordPress?